Facts matter. Hitting MPs with these facts matters even more. Yesterday we eventually managed to get an ‘MP Special Edition’ of our Brexit Hit-Back Pack into Parliament. This Pack consists of six pages: a covering letter, plus five factsheets on the Customs Union, Single Market, Withdrawal Agreement, Irish border, and the WTO solution. Unfortunately we could only produce 100 packs, about which more in a moment. The purpose of these packs is simple. They contain real, official facts at a basic level, and they are punchy enough to be read. Many MPs don’t even have this basic knowledge – we know that from listening to them in Parliament and in the interviews they give to the BBC, Sky News, and ITN. The MP Special Edition of the Brexit Hit-Back Pack was designed as our latest effort to get the facts across. Here is the PDF - one document with covering letter and the five factsheets. We know that many MPs are so far entrenched in their Europhilia and disdain for the electorate that they are beyond repair. But at least they can’t say we didn’t try to educate them. For many other MPs, however, this information might just make them pause for thought, when considering another rejection of the will of the British people, as affirmed in the EU Referendum of June 2016. If we are able to persuade just a few MPs to row back from a catastrophic decision between now and Friday, then it might just tip the balance. You could help, if you want? This morning we need to get over 500 more packs delivered to Westminster. If you are reading this and are a business owner with a laser printer in your office, please contact us asap. We urgently need to get more packs printed, stapled together, and put into A5 envelopes. We have the contacts within the Palace of Westminster to get these packs to all MPs fast. But we don’t have a laser printer, nor the funding to pay someone to print and stuff envelopes. We have a list of all the MPs and if the labels for the envelopes could be printed that would save a lot of manual handwriting but isn't essential. STOP PRESS : A generous individual reader has just offered to cover one-third of the cost of getting these packs printed professionally this morning, so we can get them to MPs faster. We still have to cover the rest of the cost (£500) plus the cost of over 640 envelopes and labels, plus travel costs around London getting all this together. Can you help? Quick and secure donation options are below. Happy to credit you if you want, or confidentiality assured if you prefer to remain private. Yesterday we didn’t stop and, dear reader, you would be proud of the hard work of certain team members in getting the first 100 packs to MPs. It sounds simple, but believe us it wasn’t, for all manner of boring reasons. If you can help, please contact us asap. Well done for your efforts. Sorry I can't help as I don't have a laser printer and I'm not in London, but I sincerely hope that you'll get there! An outstanding piece of work Facts4EU! Irrefutable. indeed very well done for all your efforts, facts are gospel. I think a large proportion of the 'bubble' are now beyond redemption. I read this morning of another new scandal, of them buying houses with taxpayer monies and now making huge profit selling same. The taxpayer money being given as a help to buy a London base whilst an MP for when they are in the capital. I sent this pack to my MP (for what is worth) - He represents a Leave Constituency but has voted remain in all parliamentary votes - absolute traitor. Maybe he needs educating - maybe this pack will help. May and previous Prime Ministers have already signed up to the single EU Defence pact. Of huge significance. It's been planned over decades; not just a recent thing. The tie-in we now have to this one EU controlled army has massive, massive implications: not just funding, not just sharing security know-how, not just big businesses in Defence supplies having influence over our politicians on this, and not just our inability to decide if we go to war or not, and against whom. The dismal list goes on. All this sharpening of pens by PMs eager to sign away yet another part of our self-determination has been done behind closed doors, hidden from us the paying public. T. May, knows exactly what she is doing. And so do her Civil Servants. That is why, I submit, she is desperate to keep the British within the EU AT ALL COSTS. She has made a pact with them already. 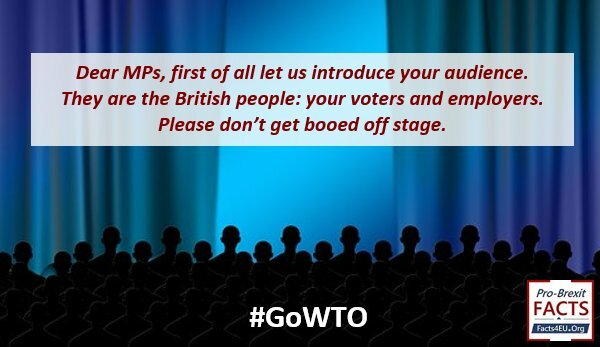 The EU circus show of 'bashing' Britain over trade deals is just that. They are desperate for our money. The only way that declining Germany and France can move on to their expansionist mad-cap plans is to have our cash. That is why the terms on offer are now even more punitive than before we decided to Leave by Referendum. The rot in our so called Democratic system is so huge it must be purged. We will not be tied as serfs to the sinking, bloated, corrupt monstrosity called the European Union. We must have a new Prime Minister who will get us out without a Deal. All negotiations are over. We should now just go.